Disconnect power first 1. Remove the cabinet. 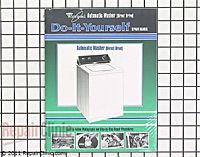 There is now 4 ways to lift up the consol on a Whirlpool built direct drive style washer. Exposed screws, hidden under the plastic end cap screws, screws behind the consol and now....no screws ( see pic below ). Newer ( last few years ) version has a push clip that must be released before the consol can be pulled forward and then up. 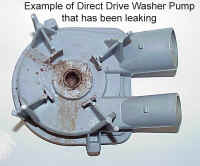 Direct drive WLP style Kenmore, newer version. Lid switch is now under the consol on this newer version. Consol has two clips between the consol and top panel. Need a putty knife or such to push in to release the clips to lift the consol to access the switch. Clips are #8 on the picture, click the picture for a larger view. Once the consol is released, same procedure to remove the cabinet as the older versions. This is the first repair procedure on this type machine. 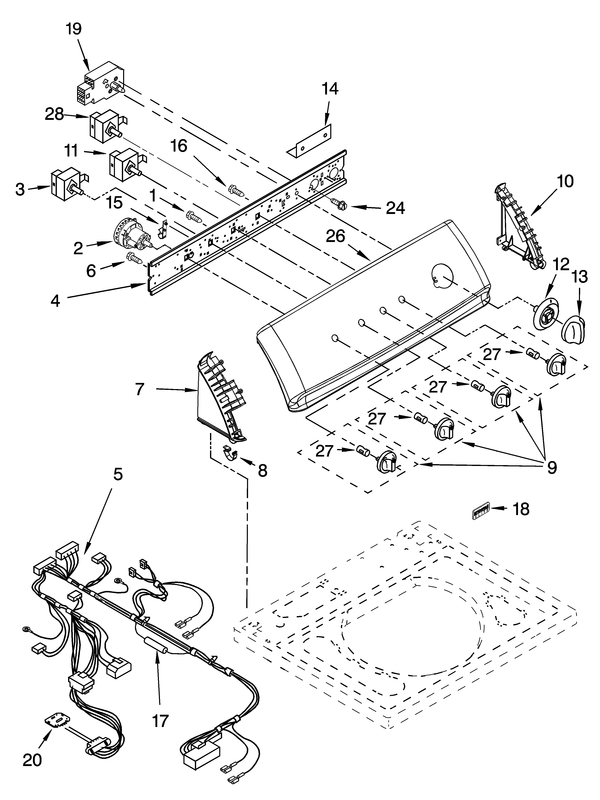 You must be able to disassemble and put the washer together in order to accomplish repairs. Begin by removing the 2 screws in the control console. Picture. Some screws are now hidden behind plastic covers. Picture. On some newer style washers the consol screws are now on the back of the consol. Picture. Pull forward and up on the console and you can hinge it open and hanging from the hinges. 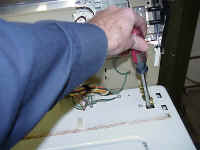 Using the flat blade screwdriver remove the two brass colored clips that hold the cabinet to the rear of the washer. Picture. Unplug the wires leading to the lid switch. Picture. Pull the cabinet toward you and tilt it. 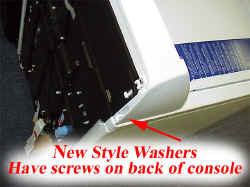 It will disconnect from the base of the washer and come completely off. Picture. 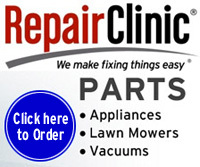 You are now where you can make repairs on about any component in the washer. Disconnect power first 2. Replace the cabinet. 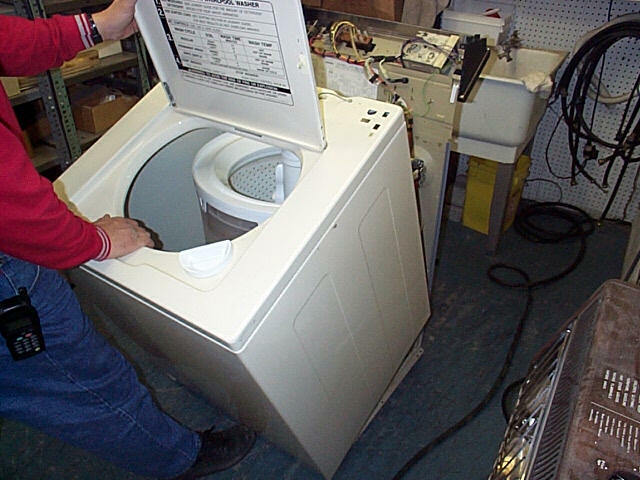 Look at the base of the washer on the sides. You will see two extrusions or metal tabs that mate with slots in the bottom of the cabinet. The cabinet has a lip on the bottom front that goes under the bottom frame of the washer. Picture. Place the lip under the base, let the cabinet down to mate to the extrusions on the base. Line the back up to the cabinet and replace the brass colored clips that hold the back of the washer to the cabinet. Plug the lid switch back in. Put console back in place and install the screws holding console. Disconnect power first 3. Check or change the lid switch. Unplug the washer. Check the actuator on the lid that operates the lid switch to see if broken. Open the console of the washer. After removing the screws, the console will lift up and hinge back. Disconnect the plug going to the lid switch. Picture. Check the lid switch [lid closed] with an ohm meter from the wire plug-in leading to the switch. If no continuity, replace the lid switch. You will need to remove the cabinet to replace the switch. There are only a couple screws holding the lid switch assembly and a ground wire connection to the cabinet. 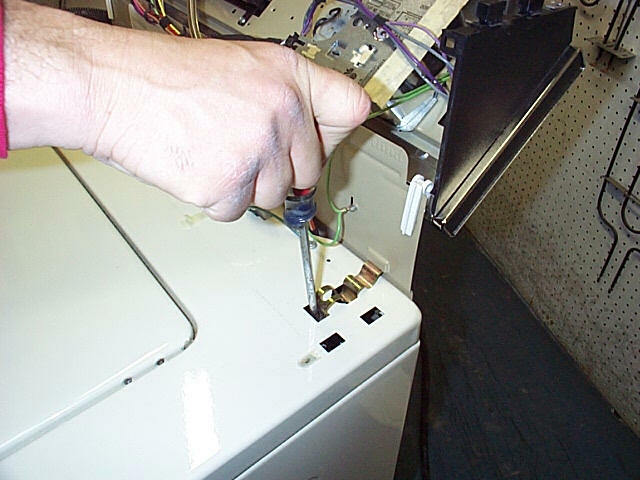 Reassemble the washer and test the operation. Unplug washer, remove the two consol screws and tilt console back, remove cabinet clips, unlock lid switch block and then remove the cabinet. Remove the lid switch mounting screws, disconnect ground wire and remove lid switch assembly. Compare old switch to the new one. If the plastic sleeve of the new switch is longer, break off at the score mark. Pull wire partially out of sleeve before shortening sleeve. If the sleeve had to be shortened, the wires must be looped to take up the excess wire. Use supplied wire tie from the new kit. Install new switch assembly. New lid switch pictures are here. Disconnect power first 4. Pump service. In order to service the pump, remove the cabinet. The pump is located on the end of the motor shaft. 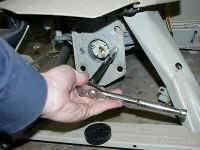 Remove the 2 thumb clips holding the pump to the motor, pry off clips with a flat screwdriver. Picture Place a container under pump to catch water and remove the clamps from hoses. The drain pump normally will pull off of the motor shaft, pull straight out on the pump towards you. 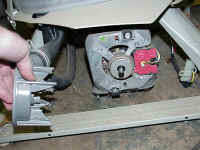 The pump sometimes will become "frozen" to the motor shaft as the motor shaft can rust. 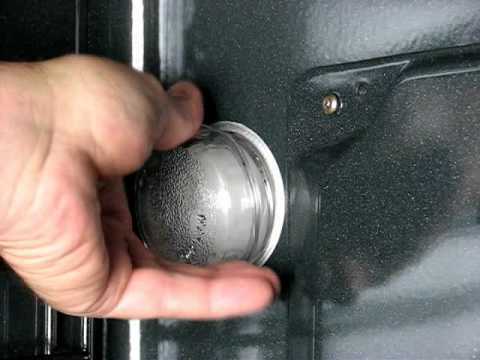 You may have to break the old pump off the motor shaft if it has frozen itself onto the shaft, a large straight screw driver and a hammer can do this. I usually split the pump open using the flat screwdriver, use caution when hitting the screwdriver with the hammer so you do not drive the screwdriver through the pump and damage the motor. 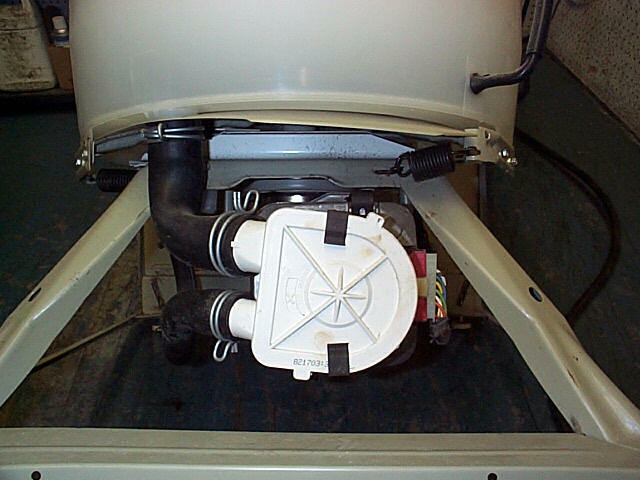 If the motor shaft is rusted, you should sand and clean up the shaft before installing the new pump. Change hoses to the new pump. Line the shaft of the motor up with the impeller slot on the pump, and push the new pump on the motor shaft. Replace thumb clamps and Replace the cabinet. Check your repair. Line up the slots on the motor shaft and center of the pump. Picture. Disconnect power first 5. Motor coupling. 6. Motor replacement. 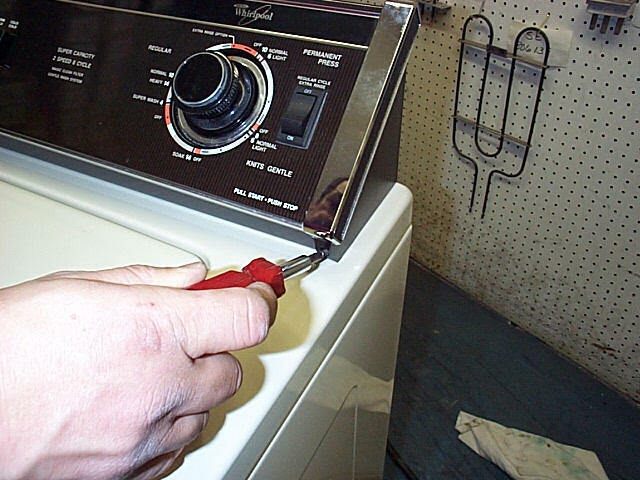 The motor to transmission coupling replacement is a common repair on this style washer. Start by removing the cabinet. Remove the pump from the motor shaft, this is not needed if just replacing the motor coupler. You may be able to shift the motor & pump off to one side. If you are replacing the motor = the pump must come off. It is not necessary to take the hoses loose. Tie the pump out of the way after getting it off the motor shaft, if needed. Unplug the motor wire harness. Picture. Unscrew the two 5/16 sheet metal screw holding the mounting clamps to the motor. Release the thumb clamps and take motor loose from transmission. You have reached the point where you can replace the three pieces of the motor coupling. Picture. Picture. Picture. Look at the old pieces to see how to assemble the new, Here is a picture pointing them out. Picture Place either of the two new white couplings on the transmission shaft with the teeth facing toward the motor. Use an 1/2"socket as a press, place it over the center of the coupling and lightly tap it onto the shaft, taking care not to damage the three little prongs. Place the black rubber union over the prongs on the coupling you just installed. 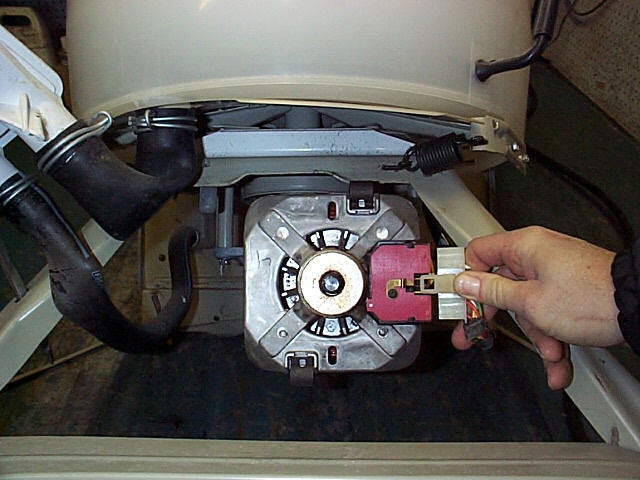 Now, tap the other coupling onto the rear shaft of the motor, prongs facing back toward transmission. The motor can now be re-installed, take care to line up the three prongs with the remaining holes in the union. 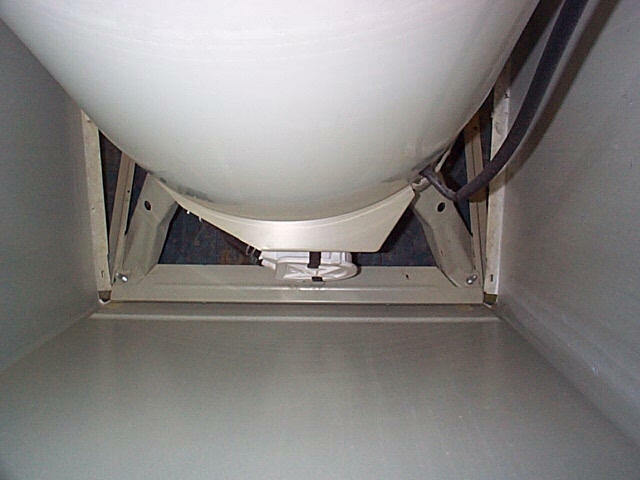 This can be helped by rotating the motor shaft slightly while holding it up to the coupling. Also, remember that the four rubber caps on the motor mount must match up with the four indents on the frame. 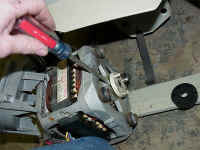 Once the coupling is engaged, apply the clips & screws to the motor. Hook up the wires, install the pump and you're finished. 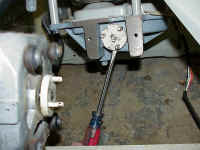 Hook thumb clamps, replace the two screws. Put pump back on motor shaft and hook thumb clamps. Replace the cabinet and check your repair. If you need a little more motor help, please go to that page. Disconnect power first 7. Remove the basket. 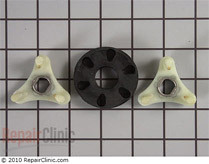 To remove the inner basket you will need a spanner tool to remove the inner basket, remove the agitator, remove the tank cover, remove the nut and lift up of the inner basket. You may be able to get away with using a straight screw driver and a hammer. Once the tub nut is off, sometimes the tub gets frozen to the center hub. If the tub will not lift out, sometimes putting one foot inside of the tub and stomping down will break it free. Two people, one on each side can also lift up and push down at the same time, may also break the inner basket free. Disconnect power first. 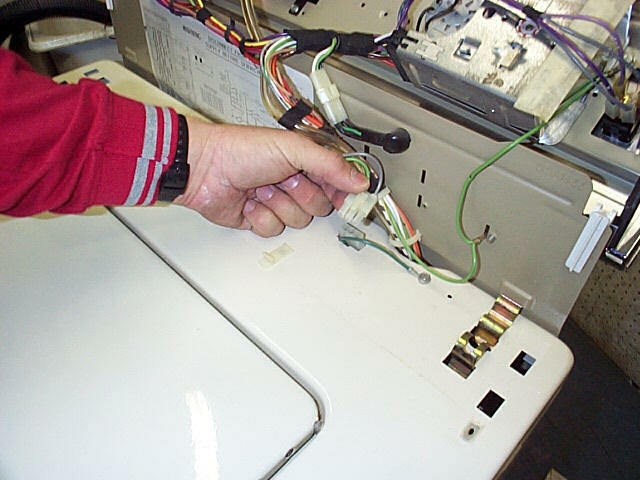 Unplug washer, remove the cabinet, remove the pump, disconnect motor harness. See fig one. Disconnect 2 terminal plug ( 3 speed motors only ). remove the motor start switch. See fig one. Remove start switch by removing mounting screw, see fig one. Install new switch, using original mounting screw. 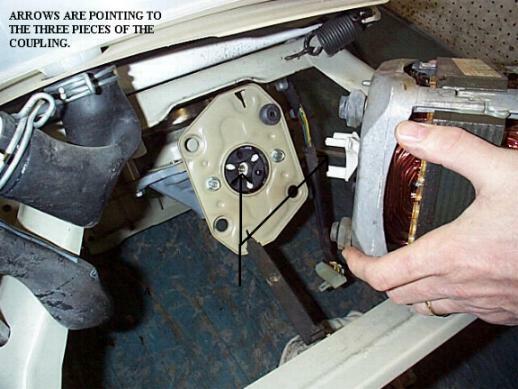 The switch lever must be on top of actuator sleeve inside the motor. See fig two. Connect the motor wires to the start switch. See fig three. Connect harness plugs ( 3 speed only ). Connect motor harness. Install the pump, install the cabinet. Plug in washer and test.